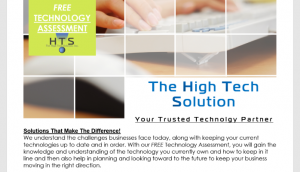 A FREE Technology Assessment for your Business! Business owners, have you ever wondered what your business network actually looks like? Are you curious to see what is actually running in all the deep, dark corners of your network? Looking to save money and have technology work for you? Would you like to see what industry best practices you could be utilizing for your business? If you answered yes to any of the above questions, give us a call now for your Free Business Technology Assessment by The High Tech Solution.